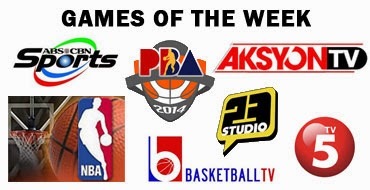 TV Schedule: Games of the Week (January 5-11, 2014) - Balita Boss! Here’s a look at the games of the week scheduled on television. To open the week, Cavaliers and Nets will play live on Basketball TV. Oklahoma City Thunder visit Minnesota Timberwolves live on ABS-CBN. Ginebra, San Mig Coffee, Rain or Shine and Global Port return from the holiday break to continue the PBA Philippine Cup 2014. Actions from UAAP 76 Women’s Volleyball will also continue this Sunday on Studio 23. TIME: 9:00 a.m./ Replay 9:30 p.m.